This content was paid for by Ledge Lounger and produced by Swim University (Ace Media, LLC.). We only reach out and work with sponsors we trust and recommend. Last Updated: June 8, 2017 | Subscribe to our weekly newsletter! You can create the perfect outdoor space, no matter your budget. The first step is choosing the perfect item to build around, then growing your plan from there. When your budget is small, choosing the right staple for your space is the most important step. You want value for your money, a piece that will last a long time, and will look nice with any changes you make to your other decor during its lifespan. 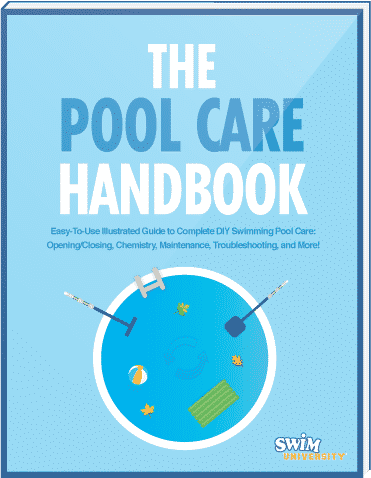 With some smart purchases—and maybe a little elbow grease—you can beautify your pool area on the cheap. A durable, high-quality piece that offers functionality and sleek design. You can choose clean white, granite, sandstone, or a burst of color. Set your drink on the ledge, put ice and up to 12 drinks in the middle, and even slip an umbrella into the sleeve in the middle. It’s easy to clean with a Magic Eraser (those things really are magic! ), and it’s resistant to damage from sun and chemicals. This isn’t really about decor, but ambiance. 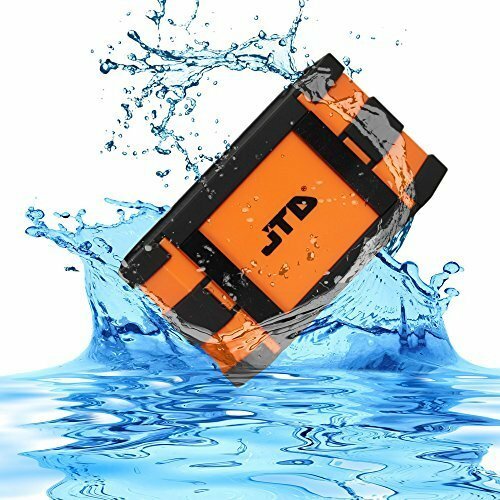 Put a floating speaker in your pool and connect it to your music library via Bluetooth. Your pool area can be transformed into a relaxing spa with soft, pleasant music, or a fun, splashy, party spot with some good ol’ rock-n-roll! 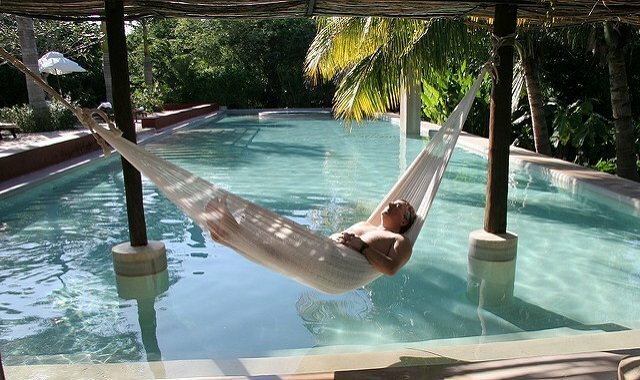 You can create a comforting, intimate vibe in your pool area just by adding a hammock. Fabric color and pattern choices are nearly endless, plus you can add a throw blanket or pillow for interest and comfort. Hammock chairs create a similar aesthetic as a regular hammock, but are much easier to get in and out of. These are cozy beanbag chairs all grown up. Pouf seats can be round or cube-shaped, flat like a throw pillow, or tall like an ottoman. Sew your own or buy a set. Look for mildew-resistant, washable fill or foam, or an inflatable insert, as well as outdoor fabric that is resistant to ultraviolet (UV) rays, mildew, and water. If you’ve ever put together furniture, you can make one of these benches. You need cinder blocks, 4″ x 4″ x 10′ lumber, sandpaper, and some paint or sealant for the wood. You can build the bench with or without a backrest, and add cushions for color and comfort. You don’t have to shell out a ton of cash for fancy, oversized pots to use plants in your pool area. You can decorate plain pots with paint, fabric, lace, or jewels. Even if you’re not a master crafter, you can give a plain, old pot some personality by painting a simple, shimmery, gold stripe around it. Or add just the right accent by painting one pot a bright, bold color. Another fun way to use these inexpensive concrete blocks is to build a planter. You can arrange the blocks in nearly endless patterns. Make the planter as tall or wide as you wish, even build it into a corner. You can put succulents in it for carefree greenery, or grow herbs. Cinder blocks can even be painted to match your decor. 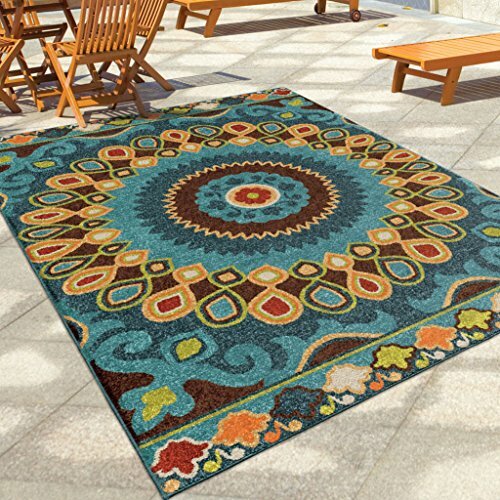 You can pick up an eye-catching five by seven outdoor area rug for around $100. Go as bold or busy as your heart desires. Use the rug to define an outdoor living area near your pool. Add a magical quality to your pool area with strings of lights. Choose twinkling LEDs, round bulbs, Edison-style, caged bulbs, or hot pink and green parrot lights. Whatever style suits your fancy, strings of lights draped above your pool area add ambiance without breaking the bank. Sometimes you just don’t want to feel like you’re lounging on the face of the sun, right? If your pool area lacks shade, but you can’t spend a fortune on a pergola, consider a shade sail. They’re durable, UV-blocking, and very affordable. If you’re crafty, you can embellish it with ribbon and sisal. Choosing pieces that pull double duty is a great way to stretch your money. An outdoor table with storage underneath If you click this link and make a purchase, we earn a commission at no additional cost to you. gives you a surface for drinks and food, plus a place to stow poufs or pool items when they’re not in use. Do you want a place in your pool area to enjoy dinner with friends? Maybe you’d like to relax with a glass of wine by candlelight on your patio. Get inspiration for your own backyard paradise with a few ideas in your mid-range budget. Seating will be one of your biggest investments. The type of seating you choose depends on the function you want it to serve. Dining sets are available in a broad range of prices and styles. Look for durable, lasting materials so this investment piece will stand up to time, sun, and pool water splashes. If a dining area isn’t your thing, you can create the perfect place to lounge—in or out of the water. These chaise loungers are available in beautiful colors or crisp white. They’re made from nearly indestructible polyethylene, which is UV16 resistant for 16,000 hours, not to mention easy to clean. You can buy virtually any style table on wheels. Choose a coffee table and surround it with cushions, or a bar-height table with stools. Whatever style, you’ll be able to move it to any area of your outdoor living space or easily push it out of the way when it’s not needed. Offer your guests a little nook to rinse off without the cost of building a shower room. Solar-powered showers hook up to a garden hose, so installation takes minutes. You can easily unhook and set it aside when not in use. These versatile pieces don’t cost much, but can add function and style to your outdoor space. Choose privacy screens made from resin to use around an outdoor shower or changing area. Place hooks or a towel rack nearby for convenience. When you don’t need it, fold it up to store. 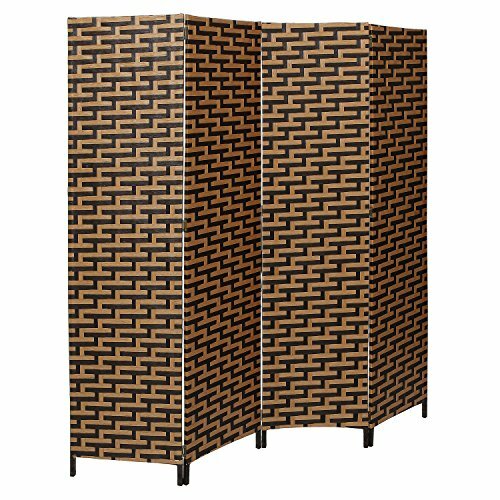 Try custom latticework for a privacy screen that reflects your style perfectly. Not just for the bohemian-style pool area, you can buy myriad styles of tapestries. Mandala prints, illustrations, and even photos are just some of the modern takes on these wall hangings. Use them on a focal wall, to separate spaces, or create privacy. Do you live in a region with lovely songbirds or exotic, tropical birds? If you like the idea of listening to birds sing while you relax in the pool, invite them to your backyard living area. Once you choose the right style of bird feeder, you can build or buy one that works with the design of your outdoor space. Adding organic elements to your pool area can give it a natural, tropical getaway quality. Just sticking some potted plants on end tables won’t quite do it, though. An interesting way to add plants without breaking the bank or taking up lots of space is a vertical garden. You can build one yourself or buy a kit with an assembled planter. You’ll find them in a range of materials and colors, from iron to wood to fabric pouches. Go beyond string lights to really make your pool area shine. Interesting light fixtures have a different quality in outdoor spaces. But even if you don’t have a roof, you can install lights. Run cables to poles for hanging lights, such as paper lanterns, bird cages, or mason jar lights. If you want to cast a gentle glow around your pool, a candle chandelier is the way to do it. It’s probably not the best solution for all you Chicagoans looking for a poolside paradise in your backyards, unless you pick up some faux candles, too. If your patio is wired for a ceiling light, you might find an electric candle chandelier works best for you. Even if you can’t install permanent lights in your pool walls, you can create ambiance with floating lights. 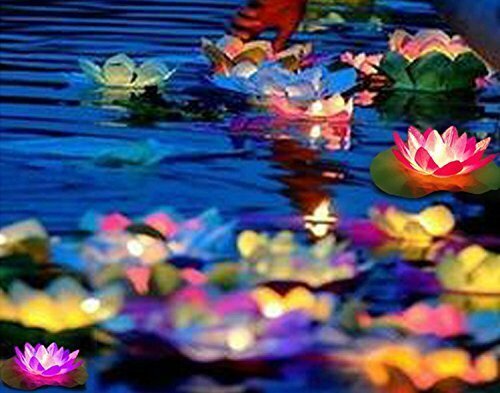 Whether your style involves whimsical floating jellyfish lights or a cluster of light-up lotus flowers, you’ll find endless possibilities in floating pool lights. Solar-powered lights are more convenient for frequent use than battery-powered lights. Your pool area needs something extra special, and you’ve got money to spend. What are the must-have pieces to take your backyard to the next level? When it comes to seating, the options are so plentiful, you may find it a bit overwhelming. A UV-resistant sectional that can be used in-water on your pool’s ledge, or poolside on the deck, is a flexible, functional foundation piece you can build around. And yes, there is a matching table available. You’ll get respite from bright sun, plus a defined space by placing a pergola over part of your pool. Put a pergola over your pool ledge with chairs so you can enjoy the shade and the water together. Picture a comfy chair and ottoman, a small side table, a potted fruit tree, a steaming cup of coffee, and a good book. Pick a corner of your pool area and build yourself a private meditation and relaxation spot. You may never want to leave it! An important element you might overlook in your outdoor space is sound. You don’t want the sounds of traffic or sirens in your perfect pool area, but what sounds do you want? Replace annoying noises with soft white noise by adding a water feature to your pool. Waterfalls and fountains can be installed inside the pool or on the edge. Not only are they attractive, water features help turn your outdoor space into a soothing, peaceful environment. The days of plain, yellow pool lights are long gone. You can install multi-colored LED lighting with control dials or even remote controls. Adjust the color and brightness to suit your mood. Create a unique walkway from one side of your pool to the other by installing a bridge or concrete pads. By guiding guests across the pool with a path, you’ll be able to use the space on the far side of your pool for additional seating, a small garden, or even a whole second living space. 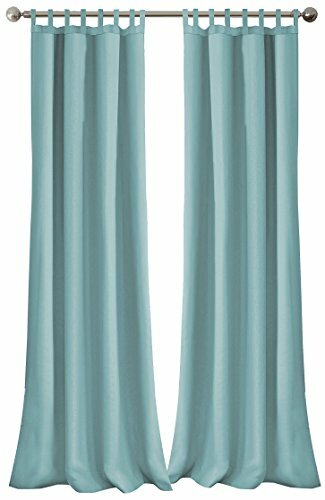 Though they may not be your first thought for outdoor decor, floor-length curtains on a hanging rod can delineate your space while adding color and motion. They can easily be swept aside to open up a space, or closed to create an intimate atmosphere. Hang curtains from the sides of a pergola, between dining and swimming areas, and anywhere you want the option of privacy. Choose bright white for a cool, neutral look, or go with bold colors and exciting prints to draw attention. A swim-up bar with underwater stools is a fun addition to almost any size pool. 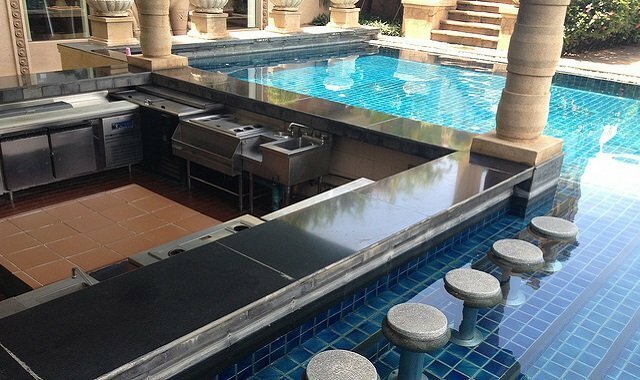 If you don’t already have a swim-up bar, they can be built into your existing pool. Professional designers will create a plan that flows with your current pool area.You can buy molded stools that sit on the bottom of your pool and can be moved or removed whenever you like or have permanent stools built right in. Who wants to leave the party just to make dinner? Small or large, optimal outdoor kitchens need a place you can prep, cook, and serve. Modular grill islands are an all-in-one solution. Add the light and warmth you can only get from an open flame. Copper fire bowls with glass rocks are a stunning, long-lasting way you can enjoy a small fire by your pool. Choose a gas fire bowl for adjustable flames with minimal upkeep. Some even have waterfalls. Yes, waterproof pool tables exist! 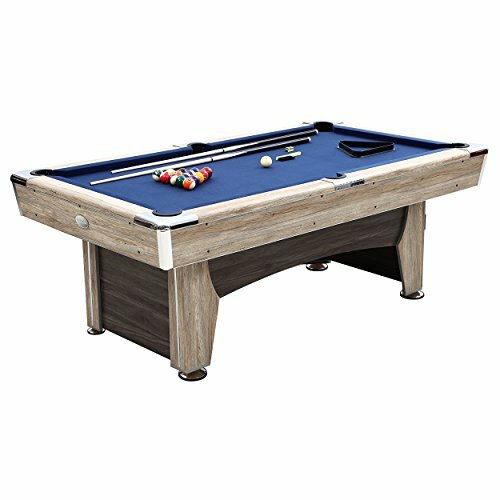 While you might not be able to play billiards underwater, you can put these weather-resistant tables outside without worrying about exposure to rain. When arranging elements in your pool area, use rugs and furniture to create a “space within a space.” Ensure easy flow of foot traffic, by leaving openings between furniture facing the pool, entrance, and exit. Use mobile accessories like tables on wheels to guide guests from one space to another, such as from the dining table to the pool ledge. Keep utility, color, texture, and sound in mind when planning which items to buy or build, and how to arrange them. With a little imagination, some time, ingenuity, and maybe a little DIY effort, you can make your backyard pool area a paradise.